He forewent figure skating for fashion, and still won. The Sochi Olympics have undoubtedly been an explosive force for news, athletically and, more so, politically. 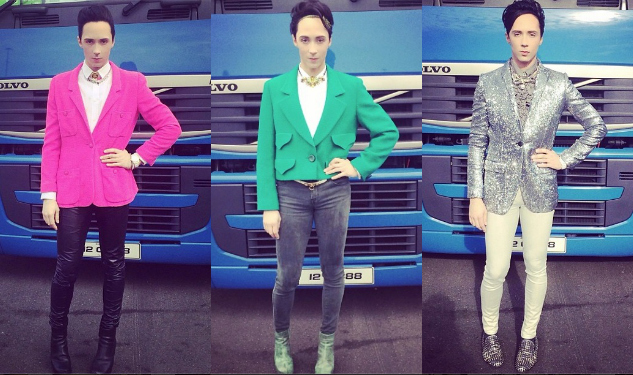 But as they come to a close this Sunday, it will be of the utmost importance to remember one of the true standout stories: Johnny Weir's fashion choices. Although he abandoned his home arena of the ice rink when he announced his retirement from professional figure skating last year, Weir started another fierce competition—with himself—to make every day's outfit better than the previous. A brilliant plan, designed so that he'd emerge the winner, no matter what. To commemorate the close of this blazer and skinny-pants extravaganza, we've compiled the Instagram shots our figure-skating fave so graciously posted throughout the games via his personal account.